Bahraich बहराइच is a city and a municipal board in Bahraich district in the state of Uttar Pradesh, India. Located on the Saryu River, a tributary of river Ghaghra, Bahraich is 125 km north-east of Lucknow, the state capital. The towns of Barabanki, Gonda, Balrampur, Lakhimpur and Sitapur share local boundaries with Bahraich. 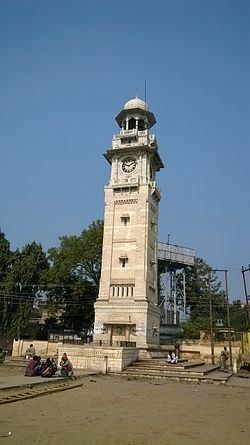 A factor which makes this town important is the international border shared with the neighboring country, Nepal. According to Government of India, the district Bahraich is one of the minority concentrated district in India on the basis of the 2001 census data on population, socio-economic indicators and basic amenities indicators. Bahraich is located at 27.58°N 81.6°E﻿ / 27.58; 81.6. It has an average elevation of 126 metres (413 feet). Bahraich has a warm humid subtropical climate with cool, dry winters from December to February and dry, hot summers from April to June. The rainy season is from mid-June to mid-September, when Bahraich gets an average rainfall from the south-west monsoon winds, and occasionally frontal rainfall will occur in January. In winter the maximum temperature is around 25 °C (77 °F) and the minimum is in the 3 °C (37 °F) to 7 °C (45 °F) range. Fog is quite common from late December to late January. Summers are extremely hot with temperatures rising to the 40 °C (104 °F) to 45 °C (113 °F) range, the average highs being in the high of 30s (degree Celsius). Bahraich has a vast forest cover. Shisham, Dhak, Mahua, Babul, Neem, Peepal, Ashok, Khajur, Mango and Gular trees are grown here. Different varieties of mangoes are grown specially Dasheri in district. The main Crops are Wheat, Paddy, Sugarcane, Mustard and Vegetables such as Cauliflower, Cabbage, Tomato, Brinjals are grown here. Apart from this many medicinal and herbal plants are also grown here like Tulsi, Peppermint. As per provisional data of 2011 census, Bahraich district had a population of 3,487,731 out of which males were 1,843,884 and females were 1,643,847. The literacy rate was 64.20 per cent. Badihaat, Dargah Shareef (Included Parli Bagh, ImamGanj, Bakshipura), Bakshipura, Bakshipura Nai Basti, GulamAlipura, Choti Bazar, MansoorGanj, Hamzapura, WazeerBagh, Qanoongopura(South & North), DhapaliPurwa, MakkaPura(Raipur Raja), Rahuwa, Civil Lines, Akbarpura, Khatripura, Gudri, Chawani, sufipura, Digiha Tiraha, Ghasiyaripura, Meerakhelpura, Peepal Tiraha, Madahav Rati, MATERA KALAN, BEHRA, RAKHAUNA, KHAIRA KALAN, SHIVPUR, NANPARA, etc.. The main occupation of the residents of Bahraich is agriculture. In the British period, Bahraich was a famous market for grains and pulses. Even today, it is famous for agricultural products like pulses, wheat, rice, corn, sugar, and mustard. Bahraich also has a Galla Mandi(Grain Market) which is second biggest Grain Market in Uttar Pradesh. Also, there are dense forests in Nanpara and Bhinga region which account for herbs and timber. Trees like teak, Shisham and Khair are found here. As a result, "kattha" factories are situated in Mihinpurwa block of Baraich. Ideal wood for furniture and buildings work is found here. Fruit trees grown here are mango and guava. The principal crops of the region are wheat, rice, sugarcane, pulse, and mustard. Sericulture is another occupation of the people of the region. Bahraich is divided into two Parliament Constituency Bahraich and Kaisergunj. Bahraich is a growing district in the direction of education. Among many languages spoken in the district are Awadhi, a vernacular in the Hindi continuum spoken by over 38 million people, mainly in the Awadh region. A wide range of Awadhi is spoken in Bahraich. Urdu is also a majority spoken language in the city. English is a most liking language. Bhojpuri & Sanskrit also spoken. As Bahraich is situated in The Awadh region has its own distinct Nawabi style cuisine, the most famous cuisine of Awadhi Region consist of various kinds of biryanis, kebabs and breads. Kababchi Gali of district is famous in nearby regions for its Kebabs. In the past pehlwani, kabbadi, chess, kite flying, pigeon flying, and cockfighting were popular pastimes. Today cricket, football, badminton and hockey are among the most popular sports in the city. The city has its own sports stadium called Indira Gandhi Sports Stadium; it host many sports tournaments every year. The city also has many sports clubs. Bahraich is well connected with other districts of Uttar Pradesh. UPSRTC provides road connectivity to Lucknow, Kanpur, Allahabad, Varanasi, Bareilly, Haridwar, Delhi, Balrampur, Gonda, Barabanki, Pratapgarh, Shimla, Mathura, Banda, Jaunpur, Gorakhpur, Varanasi, Shrawasti and Agra. There are buses for Lucknow in every 15 minutes. NH 28C connects the city to Barabanki and state capital Lucknow. Bahraich is also on Indian Railways route map and provided a meter gauge line, running from Gonda to Bareilly and serve by several slow speed train and an express connecting Kasganj to Gonda. Jarwal Road is a small station 55 km from district headquarters and lies on Delhi–Barauni line. However, there have been talks of the State Government with Ministry of Railways for the development broad gauge line and connect Bahraich with Lucknow and other major cities of Uttar Pradesh. Gonda to Bahraich railway route is closed since July 2016 and work is in progress for broad gauge conversion and this is expected to be completed by mid 2017. New rail line to Balrampur via Shravasti is approved and work is going to start soon. And as per news from rail ministry this will be extended to Mehndaval, Khalilabad. Private Auto Rickshaws and Cycle Rickshaw are also part of transportation; those are easily available at all major landmarks of the city. The prominent English dailies of the city are The Times of India, The Hindustan Times, The Pioneer. Several daily newspapers in Hindi and Urdu are published in the city. Amongst the Hindi papers are Dainik Jagran, Amar Ujala, Dainik Hindustan, Rashtriya Sahara, Jansatta. The main Urdu papers are The Inquilab and Rozanama Rashtriya Sahara etc. Some of Them also have their Local Offices in City. All major Indian news channels and newspapers have correspondents in Bahraich. Bahraich has an All India Radio Relay station known as Akashvani Bahraich. It broadcasts on FM frequencies @ 100.1 . Roughly 50 km from Bahraich, there are remains of an ancient Buddhist monastery. This place is known as Shravasti and it is one of the most popular destinations around Bahraich. It is a holy place for Buddhists and Jains, where Lord Buddha spent twenty four years of his life preaching Buddhism. Shravasti is visited by tourists from Korea, Japan, Sri Lanka & China. Bahraich hosts the biggest wildlife reserve of the state of Uttar Pradesh - Katarniya ghat wildlife reserve. It is located at the distance of about 86 km by road & 105 km by rail from Bahraich city, the district headquarters of the Bahraich District, U.P., India, about 7 km from Nepal Border, Lucknow 205 km, nearest market Bichhia Bazaar is 6 km. Tiger, Leopard, Swamp Deer, Chital, Kankar, Flying Squirrel, Blue Bull (Bison), Sambhar, Black Buck, Barking Deer, Wild Boar, Jackal, Bear, Deer, Rhinoceros, Elephant, Four Horned Antelope, Indian Gazelle, Peafowl. A new release on the tiger population in 2011 revealed that the number of tigers in the sanctuary and surrounding areas (Indo-Nepal) is rising.